Guess that whole Scrolls debacle didn't leave any hurt feelings. Skyrim is a game that lets you run around and shoot things in the knees with arrows. Minecraft is a game where you set blocks all over the place and curse at the walking cactus creepers when they blow everything up. Put them together and you've got a crazy (but cool) mash-up that will soon dominate your Minecraft: Xbox 360 Edition experience. Developed by 4J Studios in partnership with Bethesda and Mojang, the Skyrim-themed texture set for the Xbox 360 version of Minecraft will feature a themed user interface, 40 character skins, unique craftable items, and 20 pieces of music from the Skyrim soundtrack. New worlds will even generate landscapes that look remarkably similar to Whiterun, Riverwood, and Bleak Falls Barrow. 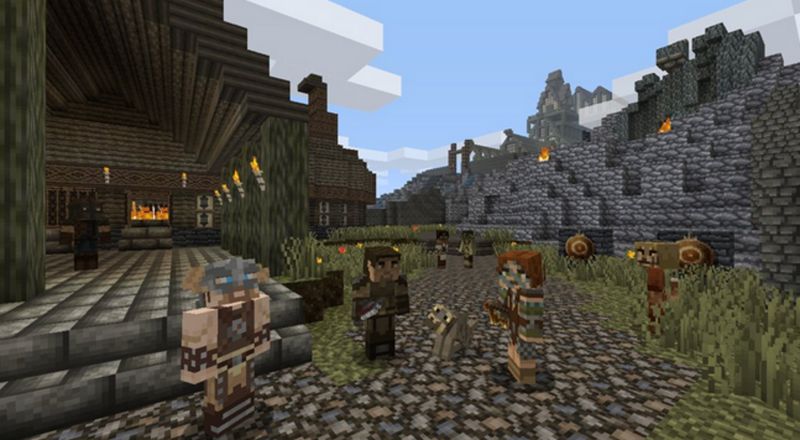 The Skyrim Mash-Up pack doesn't affect gameplay, just the look, sound and feel of Minecraft. No release date has been announced, but the mash-up will feature a free trial (saves disabled) and will cost $3.99/£2.69/€3.79 upon release. The official announcement post has a complete list of the textures to be featured in the pack. Page created in 0.2909 seconds.